The Rainbow Mountain ( Altitude 5100 M.S.N.M) of Peru 1 day hike. 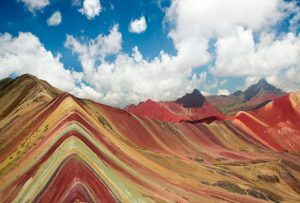 The Rainbow Mountain, offers a remote landscape experience immersing you with living local culture and a unique wildlife only found in these high altitude places. Close to “Ausangate mountain “, This is considered a holy mountain (or mountain spirit) by local Peruvians. (6,385 m / 20,945 ft), the highest mountain in the Cusco region. The area is inhabited by traditional Andean people or Quechuas. It,s a very good chance to observe the real country life in Peru. This route will take you through stunning landscapes with glaciers, snow capped mountains, and crystal clear rivers and lakes. Pass by local villages and explore the breathtaking surrounding nature with llamas and alpacas. The colors of the Rainbow Mountain are amazing! Your day starts in Cusco where you are picked up from your hotel at 5:50 – 06:20 am. for a 3 hours trip with a private van to the start of the trail. Before we continue our tour we stop at CUSIPATA where we take a breakfast. After that, we continue by car for approximately 1.5 hours more . The hike to the Rainbow Mountain will take around 2 hours and has a distance of 5 kilometers. Throughout your journey you will pass through a vibrant green valley with the snow capped peak of Ausangate (6,380 m) towering in the distance. You will see hundreds of roaming alpacas, and you have the chance to truly see how Quechua people live. As you get closer to the Rainbow Mountain you will begin to see the first signs of the colored minerals that formed the painted hills. Your guide will explain what makes up the existence of the Rainbow Mountain and how it was formed. Finally with one last push you will hike up to a vantage point that gives you a 360 degree view of the beautiful landscape that makes up the sacred land. After about an hour you will embark for your hike back to the trail head (1.5.- hours), where you will have lunch at a local restaurant and depart back to Cusco. Arriving in Cusco around 5 p.m – 6 p.m .
Elevation: 4450 m. – 5100 m.
*Breakfast and Lunch in a local community home. *This tour is involves at least 10 Km trekking so you should be reasonably fit ! *This is a challenging day of hiking. Spend some time in Cusco to acclimate (we recommend 3 days in Cusco or similar elevation). The hike takes place over 4500m (15,000ft) and is about 10 kilometers in length , with an elevation gain of 685m (2250ft). The main reason this trek is difficult is because of the elevation. The terrain is a gradual climb and you are walking in a wide valley for the majority of the trek. *Keep in mind that colors are only strong on sunny days! *There is a requirement of a minimum of 2 people to confirm this tour but it is usually confirmed everyday as it is popular.